Astrohaus released the Freewrite Typewriter a few years ago and many people liked the old school aesthetics. It had great physical keys and an E Ink screen that made it easy for authors to work on blog posts, research papers or even a novel. It did not require an always on internet connection to get your work done, but did have a switch to turn on WIFI to sync all documentation to Dropbox or other cloud storage solutions. 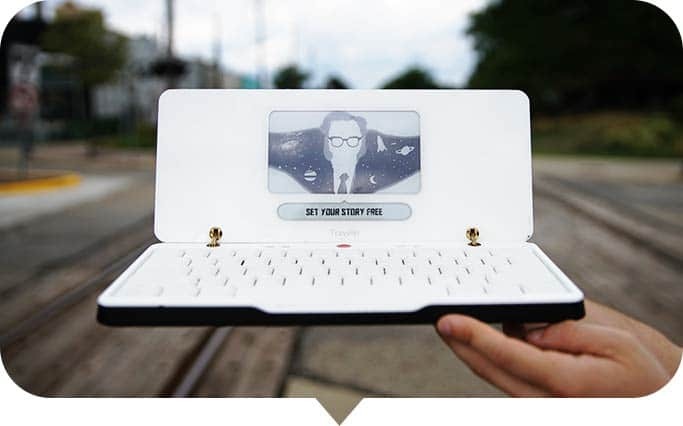 One of the shortcomings of the Freewrite was that it was too heavy and fairly expensive, $500. In order to solve both of these issues Astrohaus has just announced their second generation model the Freewrite Traveler. The Traveler is very slim and extremely portable with the clamshell design. It has a smaller screen and the typewriting keys are not as pronounced as the original. The battery lasts four weeks, thanks to the E Ink display. All work is saved locally with 256 bit encryption and then can be synced to Dropbox, Google Drive, or Evernote. The Freewrite line of typewriters blends analog with digital, which is fairly unique in the market. One of the big selling points is that it provides a distraction free writing experience, since it does not have any apps or notifications. Astrohaus will be launching another crowdfunding campaign for the Traveler tomorrow. It should be priced at around $250, which makes it affordable. The dimensions are 12″ x 5″ x 1″ and it weighs about 1.8 pounds. This post will be updated with full specs and a link to the campaign once it launches. I’m very much looking forward to this device, and hoping it will live up to the hype. I never got the original FreeWrite, although I’d wanted one due to the shortcomings I kept hearing about. Hopefully, this will resolve those. At $250, that isn’t a bad price, inline with the price of an AlphaSmart Neo when it first came out on the market. Size of the device. Small screen. They’re running a 3 minute ad on YouTube. Check it out there.